Millennials listen, watch, pin and post when they see something they do or don’t like. And they are prepared to spend more money shopping when they have been convinced by their digital peers that something is worth it. When you buy online do you read the reviews, the comments, the customer feedback? Chances are, yes you do. With social we can also get a look at how brands deal with customer complaints or service issues, matters close to all our hearts. Social matters when it comes to shopping. 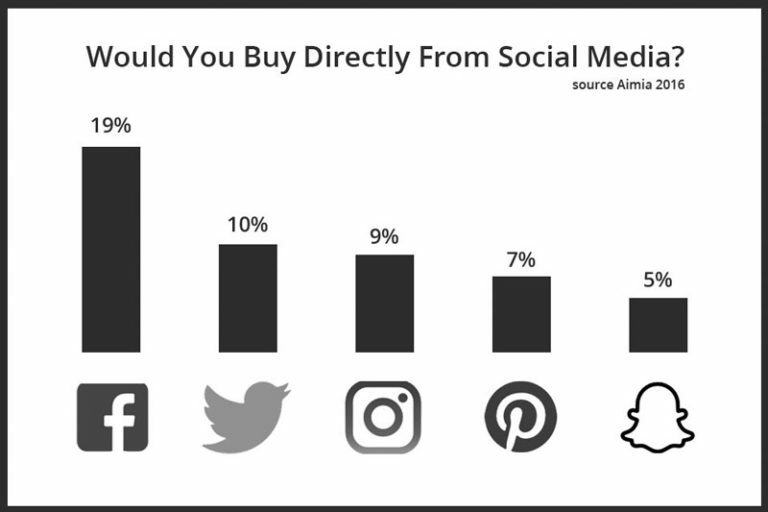 What about actually buying on social media? At the beginning of the year, Instagram began to roll out a service whereby certain anointed companies a la – Jcrew and Lulus tag their products on special posts, people can then click on them to shop using special shopping tags. In China, WeChat is already a handheld bazaar/mall, operating as a mix of Whatsapp, Amazon, Uber, and the high street. In the West we do not, as yet, have the one or two payment platforms operating across all devices that encourages this to happen. Twitter recently discontinued its buy button, and Facebook while it does now offer Woo Commerce alongside Shopify is not hitting the heady WeChat heights as yet. Customers buying online report encountering a clunky experience of form filling and fiddly-iness. But it does seem like the logical step, with Apple Pay and Android pay establishing themselves quite nicely, this barrier is disappearing. As of around ten minutes ago, while this post was being written Instagram and Shopify announced that they would allow more people (non-Americans) to use their Shoppable app. Shoppable Social Content – Facebook, Tommy Hilfiger and the New York Fashion Week. Facebook carried the show Tommy Hilfiger Show live, the content on display was all available to buy, Facebook shop assistant like bots answered questions, put items into user’s carts, which they could then buy on tommy.com. The big takeaway from the show was that the AI was able to respond to what users were looking at rather than pushing products at them. Online the Future is always now. The future looks something like this, we can effortlessly buy anything we see, facial recognition CSI type software will recognise what someone is wearing, eating, reading, watching etc. Whichever Social channel we are on will enable product recognition, we’ll be able to click on it, talk to it, ask about it, try it on in our pics, spin it around, smell it and, of course, ultimately buy it. Using our constantly enabled but biometrically secure Stripe/PayPal/Amex account we’ll pay, and then we’ll have it delivered by drone, teleportation (hurry up!) or robot courier. Amazon recently launched their hybrid version of the above, called Spark. Currently, it is only available to American Prime members but this is typically their style with for most rollouts. When you sign up to Spark you have to choose five areas of interest, these propagate your own feed, basically a mix of Instagram and Pinterest. You then are able to shop your feed, “tapping on product links or photos with the shopping bag icon.” (Independent 5/10/17) Users are encouraged to share products or posts, mimicking at least, the social media experience. Users are encouraged to share products or posts, mimicking at least, the social media experience. In many ways much of the ground has been broken, the hard work has been done. 81% of Irish adults now shop online, with an average spend of $1,200 per person and no sign of plateauing. This is more than a trend this is shopping today, witness the abandoned malls strewn across the American landscape, and what happens in America now, happens here tomorrow. The question is where will all this shopping take place and how can you take advantage of it. Instagram, Amazon, Pinterest, and Facebook are all out there swinging shopping bags, nobody’s really landed the WeChat sized killer blow, but it is not far away. Shopping on Social Media, Deal or no Deal ?? ?